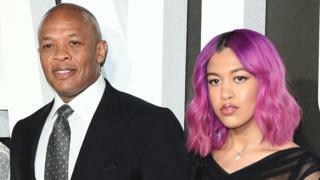 Dr Dre has removed a post about his daughter getting into a US university "all on her own" following criticism over his donation to the institution. The Instagram post was an apparent dig at celebrities, including actress Felicity Huffman, who have been charged in an alleged US college cheating scam. "No jail time!!!!" wrote Dr Dre, whose real name is Andre Young. The rap mogul and his business partner Jimmy Iovine gave the University of Southern California (USC) $70m in 2013. He posed in the Instagram photo with his daughter Truly Young holding her USC acceptance letter. He later removed the post following a backlash in the comments section, including one that posted "all on her own" followed by a string of laughing emojis and one that asked: "Is this guy serious? H really believes his money didn't play SOME role?" USC is one of the universities that was allegedly targeted in the recent scandal, although there is no suggestion that any of the colleges themselves were involved in the alleged cheating scam. There is also no suggestion of any wrongdoing in the case of Dr Dre and his daughter and donations to colleges are obviously not illegal. But the culture of parents making hefty donations to a university to boost their child's prospects is a well-known phenomenon in the US. Dre and Iovine's gift established the USC Jimmy Iovine and Andre Young Academy for Arts, Technology and the Business of Innovation. "The vision and generosity of Jimmy Iovine and Andre Young will profoundly influence the way all of us perceive and experience artistic media," said former USC President CL Max Nikias at the time of the donation six years ago. Iovine went from sweeping floors to becoming a top music executive that helped launched the careers of the likes of Eminem, 50 Cent and Lady Gaga. His partnership with Dr Dre - one of the founding members of the rap group NWA - saw him sign some of the biggest names to his record label Interscope Records. Together they produced superstars and created the company Beats - which they sold to Apple for £3bn in 2014.